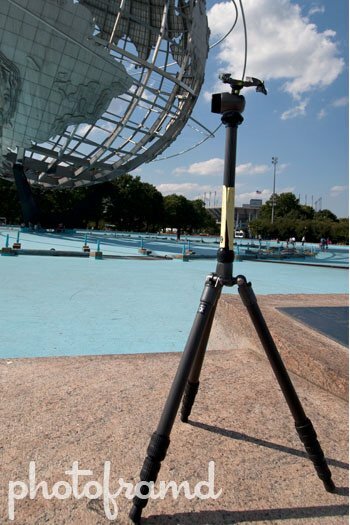 If you want to get serious about photography, you need a good tripod. The natural progression is – get a good camera and a good lens and then a good tripod. It will add clarity and sharpness to your photos by stabilizing the camera. And, think about all the fun things you get to experiment with like slow-shutter effects and time lapse photography. Of course, I know many photographers (both semi & pro) that just leave their tripods home unless then know they will need them. The biggest problem with a tripod is the weight. If you are carrying a camera with lenses in a camera bag, the extra weight of a tripod seems too much. Plus, tripods can be long and bulky, swinging wildly as you are trekking along. Most tripods are really to two parts: the tripod legs and the adjustable tripod head. Without the head, your camera would be screwed directly to the tripod legs and would be forced to view front. No tilting, no portrait shots, not minor adjustments. Better tripod heads also include a Quick-Release plate. Your camera is screwed into this plate which then attaches to the tripod head and locks in place. A Quick Release plate allows you to push a button and release the camera to take a quick shot. Without such a plate, you would need to unscrew the camera every time you need to quickly follow the action. When shopping for a tripod, you need to consider the maximum weight capacity for both the tripod and the tripod head. Yes, they can be different. All tripods and heads should have a published weight rating. 8 pounds is a good minimum weight capacity for someone just starting out. But, pro lenses with big optics of f/2.8 speeds quickly get heavy. A serious pro tripod should support a minimum of 17 pounds. The adjustment mechanism on the tripod legs falls into two types – either twists or flips. I swore by flip locks for years. Easy to unlock and easy to secure. It’s one of the reasons I love Manfrotto tripods. In fact, I remember about 7 years ago when I purchased my Manfrotto 055CX3, I tried one of those twist locks just to see the difference. It never felt secure and would give under weight. I was annoyed when I started looking for a lighter tripod and found that they all use the twist mechanism. Thankfully, I tried the Gitzo Traveler! By combining their special double-locking twist with its anti-rotation legs, the Gitzo Traveler secures easily and tightly! Manfrotto & Gitzo are my favorite tripod brands. I have used two Manfrotto tripods for years. But, as my camera bag got heavier, the tripod was left home. I fell into the weight-trap. After looking at some photos with blurred details I decided I need to get a new lighter tripod. I have been using the Gitzo Traveler ever since. NOTE – I do NOT recommend the Benro Travel Angel! It is a cheap rip-off of the Gitzo Traveler. You can see my comparison of the two tripods here. Shopping for a tripod at Best Buy will not give you a great selection. You will not see any of the pro brands there. Stores like Best Buy push price-points over value and durable use. Plus, don’t expect to get any real-life questions answered there. They are selling a box; it is up to you to learn the contents of that box. Try going to a camera store instead. There is a reason that these stores exist. Photography is not as easy as just picking-up a camera and pushing a button. Camera stores are operated by people who have actual experience in photography. You would be surprised how many sales clerks moonlight as event photographers! Picking a tripod is actually a personal experience. It is a tool which you need to count on. Having an expert along is a huge benefit. Awesome tripod – Gitzo Traveler GT1541T w/ GH1780QR head. My current tripod! 6X Carbon-fiber with magnesium hinges support 18-pounds but weights only 3-pounds (including the head!) It has a maximum height of 57-inches but folds to just over 16-inches, making it light and easy to carry. (As in the diagram above, the legs fold up and over the center column to reduce the overall folded length. Very clever!) The G-lock twist-locks take seconds to open/close/adjust, but stay secure due to the gravity locking mechanism and the anti-rotation legs. At almost $900, it is an investment in your future and worth every penny! But, Adorama has put together a special package just for my readers for only $724.95 (limited time offer)! Mid-range tripod – Manfrotto 055CX3 w/ 498RC2. My previous tripod! Carbon fiber legs support 18-pounds and weights under 6-pounds (with head). It has a maximum height of 70-inches and folds to 24-inches. Flip quick action locks make adjusting the height easy and secure. It is available for around $460. But, Adorama has put together a special package just for my readers for only $399.95 (limited time offer)! Starter tripod – Manfrotto 190XB w/ 804RC2. I recommended this tripod to someone just starting out! This aluminum tripod with head will support 8-pounds and weights under 6-pounds (with head). It has a maximum height of 57-inches and folds to 21-inches. Also has flip quick action locks for easy adjustments that stay securely. The head has larger adjustment handles which will help someone who is not familiar with tripods. It is available for around $200. But, Adorama has put together a special package just for my readers for only $189.95 (limited time offer)! It does take practice to work with a tripod. But, the results will be in your photos! Please remember to always lock your camera in the quick-release and keep the tripod legs securely locked! If you are interested in these special packages from Adorama, these special discounts are only available this week for my readers! NOTE: Some venues do NOT permit tripods or require special permits. (This is very true for indoor venues in New York City.) In spite of all that, you should still have and use a tripod where allowed.